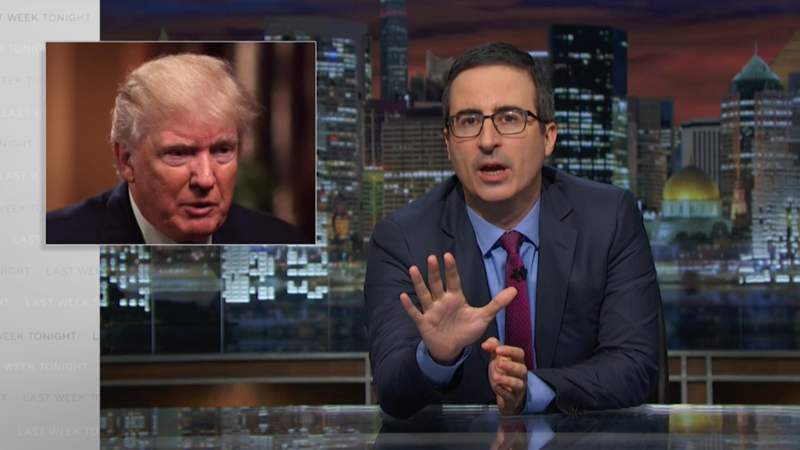 John Oliver slammed Donald Trump for disrespecting the Muslim parents of a fallen U.S. soldier who chastised him at the Democratic National Convention. "Incredibly, we may be on the brink of electing such a damaged, sociopathic narcissist that the simple presidential duty of comforting the families of fallen soldiers may actually be beyond his capabilities," said Oliver on his HBO series "Last Week Tonight." He was referring to Trump's ugly dispute with Khizr and Ghazala Khan, the parents of Capt. Humayun Khan, a Muslim immigrant in the U.S. Army who was posthumously awarded the Bronze Star after he was killed in Iraq in 2004. Trump has famously argued that Muslims should not be allowed to enter the U.S.
"Have you ever been to Arlington Cemetery?" Khizr Khan asked Trump at the DNC in Philadelphia last week. "Go look at the graves of brave patriots who died defending United States of America. You'll see all faiths, genders, ethnicities. You have sacrificed nothing." Oliver, who played segments of Khan's speech on his show, commented: "Wow. That engendered in me a level of emotion that I did not think was possible after 16 months of this depressing campaign and 39 years on Earth as a British person." Then he focused on Trump's callous reaction in an interview last week with George Stephanopoulos of ABC News. Trump speculated that Khizr's wife Ghazala was not permitted to speak. "His wife, if you look at his wife, she was standing there, she had nothing to say, probably maybe she wasn't allowed to have anything to say," said Trump. Oliver, who is married to a U.S. veteran of the Iraq war, did not pull punches in his reaction. "His wife explained that she chose not to speak because she gets too upset when she sees images of her dead son's face, you f------ a------ ," he said. "I think I've made a lot of sacrifices," said Trump to Stephanopoulos. "I work very, very hard. I've created thousands and thousands of jobs, tens of thousands of jobs. Built great structures. I've done, I've had tremendous success." Trump: "Oh sure, I think they're sacrifices." Then Oliver interjected his own opinion: "No, no they are absolutely not. They are self-serving half-truths from a self-serving half man who has somehow convinced half the country that sacrifice is the same thing as success." Later, on Sunday, Trump released this statement: "While I feel deeply for the loss of his son, Mr. Khan, who has never met me, has no right to stand in front of millions of people and claim that I have never read the Constitution (which is false) and say many other inaccurate things." On Monday, the Kahns appeared on CNN's New Day to discuss the dispute. CNN's John Berman of CNN told them that Trump tweeted that he was watching the live interview. "Mr. Khan, who does not know me, viciously attacked me from the stage of the DNC and is now all over TV doing the same - Nice!" tweeted Trump. Berman asked the Khans if they had anything to say to the Republican candidate. "There was no need to comment the way he commented," said Khizr Khan, a lawyer of Pakistani descent who immigrated from the United Arab Emirates. "He should listen to what America and what the world is saying about the remarks and the lack of empathy." "There are bad people among us," he said, "but there are good people among us as well. You do not malign the whole religion, the whole culture." Ghazala then described the last conversation she had with her son, on Mother's Day 2004. She said she asked him to "stay back" from the danger, but he replied, "Mom, you know these soldiers are my responsibility." Capt. Khan was killed after he ordered his soldiers to stay back from a suspicious-looking vehicle which he then approached himself. The vehicle exploded.